Place radicchio, carrot, cucumber and cilantro in large bowl. In a small bowl stir together Dressing ingredients until well blended; pour over vegetables and toss thoroughly. Place slaw in serving bowl and garnish. If not serving immediately cover and refrigerate for up to 1 day. 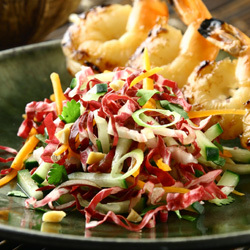 Shortcut tip: Substitute bottled Sesame Ginger or other Asian Sesame dressing for homemade dressing.